There’s no denying the impact of branded and logo-bearing objects. They lurk in plain sight and keep businesses in the consumer mind. The magic of branding hasn’t missed any aspect of office or home life. The problem with so many of these ideas is the scope. For every pen bearing a name and a number, there is a cup holding that pen and concealing the info for which you have you paid. And for every coffee cup, there’s a hand to smudge and block your carefully constructed design. 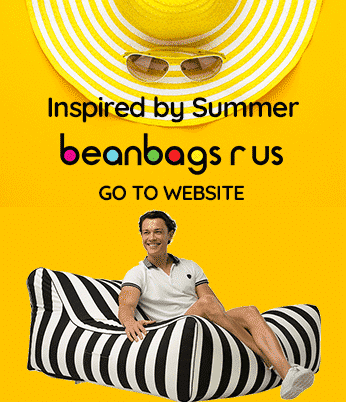 Bean bags offer a different kind of creative marketing opportunity. We’ve extolled the virtues of these opportunities here. The value doesn’t need to be gone over again. What we offer here is ten tips for getting the most out of a branded bean bag. Kick back and enjoy the infusion of ideas. We’re not here to blast you with one article filled with ‘must know’ information followed by another filled with ‘crazy stats‘ of the same. You know that getting your brand out there matters. You know why it matters. The question isn’t why but how. This list will give you some insight into what works when you scale up to giant bean bag branding. You don’t need a chart to see how much more space a bean bag offers over traditional cups, pens, and keychains. Dealing with square feet of space over an inch or less opens up worlds of opportunity. Readability at a distance goes up, and the smaller details of a logo become prominent. If you’ve built a scalable logo, this won’t be difficult to make it fit on a new product. Start over and make something bold that compliments smaller designs. A broad range of logos gives you a dynamic range of imagery for your customers to engage. Remember that a more substantial space makes effects work like inverse colours stand out more. Speaking of colour, a more extensive range of gradient hues is possible on a larger scale. Keep in mind that custom bean bags also offer more surfaces than smooth plastic. Texture can play a role more viscerally. Researchers and experts have been fascinated by how colour makes us feel and act for a while. If a touch of colour can enhance a mood, an object large enough to draw a room together is going to offer even more. Consider neutral tones that blend well or bright tones that stand out. Use colour to express the seriousness of your business and its offerings. Or go the other direction and let customers know you understand that life/work balance. Break out of the two and three tone thoughts of small readability and show off your most specific ideas. More space gives you the option to bring out negative space tricks prominently. Negative space uses the blanks in design to produce further elements. A larger canvas gives the eye more places to focus and to bring out these designs sufficiently. Textured fabrics provide an additional way to enhance negative space to bring out a smart element. Once an aspect of this type is visible in a larger image, it becomes easier to see in the smaller ones. Negative space designs also give you the ability to show your brand is multi-aspected. Consumers gravitate towards one aspect over another and are quick to share and discuss these views with others. Doing this increases the reach of a logo through added engagement. By tone, we are referring to the style of the message, not the colour tone, which was covered before. A bright coloured bag offers a sense of fun while a dark colour with an understated logo conveys professionalism, even in a lounging device. The fabric choice makes a big difference here too. The 70s have yet to live down the introduction of shag carpeting. Anything too shaggy conveys a 70s vibe, whether that is intended or not. Suede and velveteen finish likewise offer a specific mood. The strength of a designer bag is to give the right fabric and the right size to do the job. A cluster of smaller bags can work as a display while a single giant bean bag is its centrepiece. The placement and position of your bean bag convey its purpose. On the floor is for sitting, on a table is for display, and so on. Avoid a flat, lifeless logo when you can do more. The world of animation has taught us so much about how to bring the action into a still image. Add some movement, some gesticulation, some pizazz to logo design. Ding this engages the eye. The direction of the motion also enhances the elements. Direct the light with shadows and highlights to further draw the eye to specific elements. If you incorporate a mascot into the piece, it is crucial to keep the mascot on-message and vibrant. A logo in motion suggests progress. Customers like to work with a business on the upswing and avoid those they see as stale or in decline. Much like negative space, a visual double entendre gives you more imagery for the same real estate. When coupled with previous suggestions, you can indicate two or three things within a combination of elements. Don’t worry about overcrowding or muddying imagery with this kind of visual layering. The eye/brain interactions rarely pick up more than one image at a time. Consider the young maiden/old woman picture as a classic example. Even after knowing that the image contains both translations, you will still see one or the other on a glance. You have to force yourself to see the other. Which one you perceive at first glance relates to active and passive gazing. Use this rule of thumb when designing to hook customers. Smart, observant people like to receive a reward for their effort. One of the biggest bonuses of passive marketing is the growth of familiarity. The more a customer gets used to seeing your logo and branding, the more they accept it as a fact of life. Apple and Coca Cola seem to have this impression locked down better than any other companies. Disney follows in with a close third (their changing designs have shown less permeation). People take joy in the familiar. When you provide them with something worth taking pleasure in, like a bean bag or a fun logo, they translate those feelings onto the company. Cartoon logos work overly well for this, to the extent that ‘mature only’ products like alcohol and cigarettes are banned from using them. Consider the merits of making a logo that requires minimal effort to see. Familiarity has a lot of positive impacts. The cliche goes the other direction. Lean away from the expected and the overly used. If you own a painting and glazing business, you want to avoid a 4-panelled window with different colours. Not only does that look like Microsoft’s logo, but it has also been done to death by paint companies around the world. Anything you might see turned into a classic joke t-shirt of the past two decades is right out. While the temptation exists to create a whole lot and includes every piece of information you can find, there are alternatives. Single images have proven powerful and memorable. Simplicity is the power behind Nike’s swoosh and Twitter’s blue bird. These images are unmistakable from a distance and, in the case of Nike, iconic. While Apple’s logo is on the nose, others in this realm are far more abstract. To be productive while being simple, you need to rely on familiarity and an influential association. In essence, your logo needs to look exactly like your product (while avoiding cliche) or like nothing people would see elsewhere. There exists a grand fiction behind images. Not in their psychology or how visual processing works, those things are well known. The fiction comes from the why a logo looks the way it does. Consider the MGM lion. Legend has it that the trademark used a lion because its designer was making a nod to his college alma mater. The studio needed a mascot, and that mascot became the centrepiece of the logo. The history is more interesting, ultimately than the logo itself. Using elements that have a personal connection to you or the company can create a legend behind the vision endearing the company to those that know. It also increases engagement as those with knowledge eagerly explain to those without it. The marketing game comes with ever-changing rules and a total lack of referees. Don’t get caught standing around when you can lounge through the fierce competition. Nothing says winning like lying on deluxe, comfortable branded bean bags. If branding isn’t enough, consider going the extra step into full personalisation. For all your raffle and contest needs, nothing rewards a loyal customer like personalised comfort.